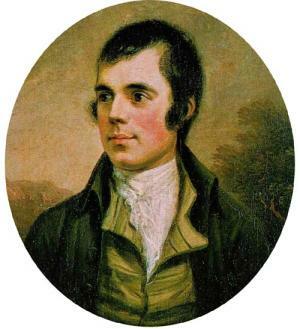 Robbie Burns: "O you, my Muse! good old Scotch drink!" Ms. Go Go has a wee touch o’ the Scots in her blood — the Ogilvie clan, doncha know — which may, in some small way, explain her appreciation of whiskey. It doesn’t exactly explain her appreciation of rum, vodka, gin, tequila, and other assorted spirits; the latter is undoubtedly due to natural joie de vivre. And Go Go’ers, if there was ever a man who appreciated his whiskey it was Robbie Burns, Scotland’s most beloved poet, who romanced women all over the Highlands in the 18th century while writing odes to his native tipple as well as to a Mouse, a Louse, and a Haggis. You’d expect nothing less from a bard whose Muse is “good old Scotch drink’. “Burns suppers”, which celebrate the poet’s January 25th birthday, traditionally include the “slaying o’ the Haggis”. Even bravehearted men and women have been known to quail at the thought of eating haggis, Scotland’s national dish of oatmeal and offal, although Larousse Gastronomique assures anxious eaters that, “Although its description is not immediately appealing, haggis has an excellent nutty texture and delicious savoury flavour”. Burns doesn’t call it the “Great Chieftain of the sausage race!” for nothing, Go Go’ers. But here’s even better news. Whiskey is an equally important component of Robbie Burns night — and every other night, in Ms. Go Go’s opinion — and with multiple “wee drams” being drunk and Burns’s odes being orated and bagpipes being…piped, you’ll be nibbling haggis like a native. You’ll be singing the juice too. Guaranteed. “Spirit Guide” Pedro Shanahan and his crew make whiskey palace Seven Grand a fave destination whether celebration or no but Shanahan promises special revelry for “Bobby Burns Night”. In addition to a a specially crafted Bobby Burns cocktail and a $5 Punch Special — bring some honest men to drink it with, natch — Shanahan is offering discount flights of Glenrothes Vintage Bottlings of ’98, ’94 and ’85 with “free education” until 8 p.m.
You always like to immerse yourself fully in your studies. 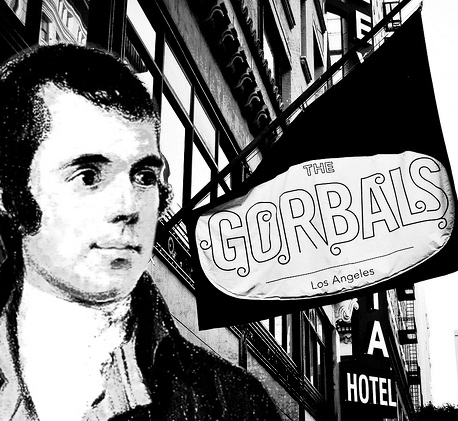 Shanahan will be conducting a reading of Burns poetry at 10 p.m. .and encourages eager orators to get in touch (Pedro@213downtown.la) if they want to take part. After drinking all that Glenrothes, “Oh Whiskey! soul of plays and pranks!” should roll right off the tongue. "Rabbie" says "See you at The Gorbals." Great chieftain of the sausage race, indeed. If you’re looking for more of a traditional Burns night, want to extend the celebration, or just “need” a reason to drink whiskey (as if) — head to Pasadena on SUNDAY, January 29th for Beckham Grill‘s “Robert Burns’ 253rd Bagpipe Birthday Celebration”. The Burns brohaha is gratis and haggis is available “if you dare”. 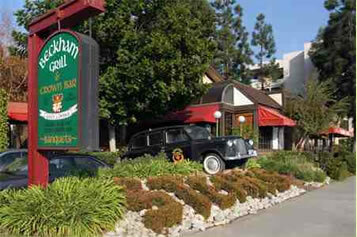 Since Beckham Grill has a solid menu of single malt scotch, you’ll definitely want to take the plunge. What single malt does for wheels of life, it can definitely do for haggis.